Celebrate love and life with the Yves Saint Laurent Heritage Collection Yvresse Eau de Toilette 80 ml, a cocktail of sparkling notes first launched in 1993. The fruity, floral and chypre harmonies of this joyful essence are as fizzy as a glass of champagne. Fun yet elegant with a twist of YSL style, it is a scent for women who live life to the fullest. With Yvresse, Yves Saint Laurent created a scent dedicated to his love for feminine women; those who make every moment pleasurable. A luxurious fruity opening awakens the taste-buds and the senses. The middle notes come from the flowery and heady notes of Rose Otto, and the dry down embraces the skin with its deeply woody notes of vetiver and patchouli. Yves Saint Laurent Heritage Collection Yvresse Eau de Toilette Spray 80ml is rated 5.0 out of 5 by 9. Rated 5 out of 5 by Janny1 from Lovely feminine fragrance I had this perfume back when it was called champagne and remember a taxi driver asking me for the name of it as he liked it so much. Have read reviews that since name and bottle shape changed its not the same. The fragrance smells as I remember it, but it doesn't seem to last the way it used to, could be that's just me, I am quite a bit older now, I find this with most perfumes. Still a lovely smell and a really good price from this site. 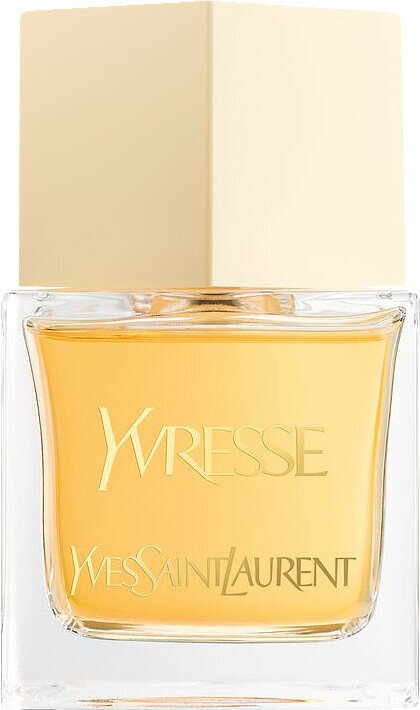 Rated 5 out of 5 by JusY22 from Absolutely gorgeous perfume I was so pleased to find Yvresse back on sale, as seemed to have disappeared for last few years. I first bought it when it went by the name of 'Champagne' and it has been my favourite perfume ever since. I get so many compliments about it. It is absolutely divine smelling. The discount offered by Escentual was extremely pleasing, and the delivery time was excellent. Overall, a very pleasant shopping experience with Escentual, and means of course, I will buy from them again! Rated 5 out of 5 by Anonymous from Yvress This is the most beautiful perfume I have ever had. It used to be called Champagne. No matter where I go I am always asked the name of the perfume as others think it is beautiful too.